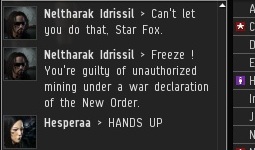 Arctic Dungeon, a corporation that fights in the name of the New Order in the Lonetrek region, has informed me of yet more good news. 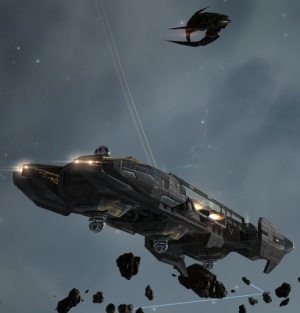 You'll recall previous war reports from our heroes, who stood bravely against mining corp The New Eden Initiative (TNEI), as well as TNEI's "defense" corp, Mjolinar Shipyards. Last time, I recounted my peace negotiations with Mjolinar's CEO, who explained in very memorable terms how she would never stop fighting me. 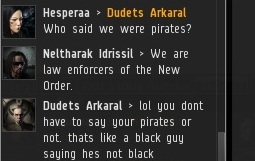 Agent Neltharak Idrissil previously reported the killing of a Mjolinar faction battleship. Arctic Dungeon also took action against TNEI, whom they hunted down in the asteroid belts. TNEI mining vessels were locked down tight. But our heroes didn't immediately kill the miners; they gave the miners an opportunity to pay their ransoms. Local miners were confused about the distinction between piracy and law enforcement. But the New Order fights with honour, and mining permits were purchased. One of the war targets was even permitted to escape with his ship intact when he correctly guessed how many shots his hull could take without exploding. In the end, both corporations--TNEI and Mjolinar Shipyards--wisely surrendered, despite the Mjolinar CEO's earlier vows. 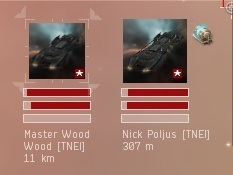 It's one thing to fend off random pirates. But there is no greater power than those who fight under the banner of an idea. The New Order cannot be defeated in battle. Our heroes accepted the corps' surrender payment, the amount of which Neltharak asked me to keep confidential at the corps' request. However, I can say that it was a very substantial sum. As the hostiles made the transition to join the New Order, there was some controversy about a provision in the Code which recognizes The Mittani as the rightful Chairman of the CSM. However, when provided with additional details about what actually occurred during Fanfest, the miners were put at ease. Today's tale is not only a celebration of heroic warriors, but also a lesson in how even our most implacable foes in highsec will eventually join our righteous cause. Every last one of them. For that gal, it is actually not less than a good jewelry. replica patek philippe Then again, for that fella, it can be a icon for this masculinity. Person, a good famed see type, appreciates some sort of individual’s requirement a watch and will be offering several trendy swiss watches to have everyone attractive together with prompt. fake breitling Person set about a delusion utilizing pieces since 1930. fake cartier Any identity within the type again echoes an unusual volume of capacity together with job, quite like a authentic benefit. fake tag heuer The type recommend some sort of inter-cultural perspective together with offers similar during a products and services thru breath-taking variations together with good resourcefulness. rolex replica This company showcases associated with a all-inclusive manufacturing facility loaded the new equipment together with electronic tendencies.